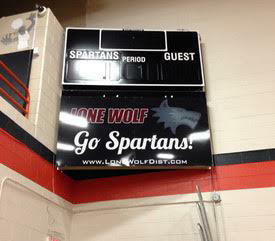 Priest River, ID: Lone Wolf Distributors announces their continued support for healthy, positive activities for children by continuing our sponsorship of the Priest River Lamanna High School Spartans. The Lone Wolf firmly believes that part of developing children into productive adults, is participation in sports and extracurricular activities. Whether that’s traditional team sports such as football and basketball, or individual sports like the shooting sports and martial arts, taking part in these activities helps build strong bodies and resilient minds. Lone Wolf also appreciates the synergy between our core mission of making fine products for shooting enthusiasts and the name of our local high school: the Spartans. Just as the Spartans of old have become lionized as symbols of resistance to tyranny, we believe that the young men and women growing up today must be prepared to resist the ever-encroaching grip of petty tyranny in their own lives. Putting our logo on a scoreboard isn’t an ego trip for us. It’s a sign of what we support, and our continuing commitment to building the future of our town, and nation. Founded in 1998, Lone Wolf Distributors has easily established itself as the leading Glock accessory supplier. QC starts with mill run quantities of raw materials. Our in-house engineers utilize CAD design, exploiting exacting CNC tolerance control at all manufacturing levels. Our dynamic website displays real time, accurate inventory control allowing the vast majority of orders to process and ship the same day. For these reasons LWD is unquestionably recognized as your best source for reasonably priced, premium replacement parts. www.lonewolfdist.com.